Max is grieving the loss of her mother, a former movie star who gained instant fame but also judgment with a horror slasher movie she appeared in in 1986. When Max agrees to be the special guest at a showing of her mom’s movie she suddenly finds herself trapped inside the cult classic. Together with her four friends they try to find out if this is all just a dream, and what they have to do to get back into the real world. I am not a huge fan of horror comedies because there is a thin line between genius and super stupid. But in this case I loved it. Was it the cast, the storyline, the setting? I believe it was everything. 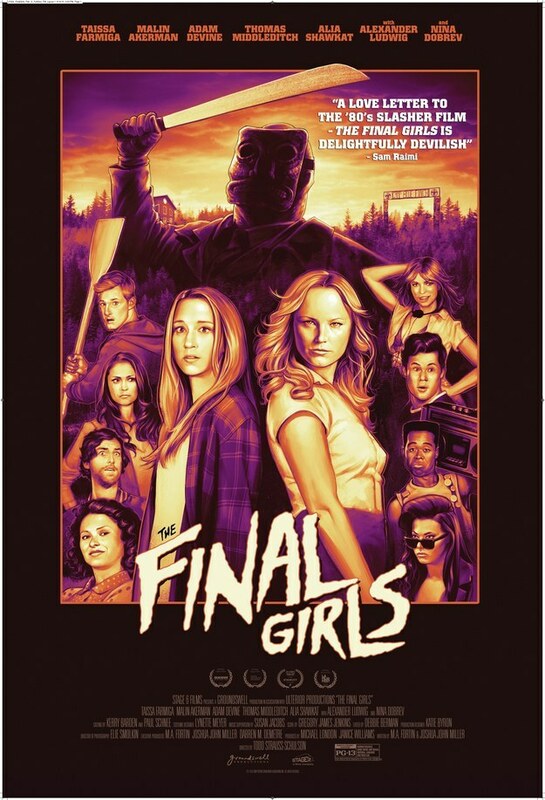 The creative minds behind this movie must have a deep love and understanding for the 80’s horror movies because it felt very much like an homage to the genre. Even the famous “CHI- CHI- CHI- Uh- Uh- Uh” – sound effect from Friday the 13th was used, which shows great attention for detail. The weird Jack Black kind of humor that Adam DeVine brings to the table fits perfectly for the slasher movie character he played. The other slasher cast was over the top hilarious and delivered their parts down to perfection as well. Taissa Farmiga – known for her great performances in American Horror Story – was a wonderful lead full of emotions and depth, and Malin Akerman was just so adorable. The only thing I don’t like is the PG-13 rating; had this movie been R-Rated it could have been even more over the top and bloodier and better. Nonetheless I think this movie is an inside tip and needs lots of attention and buzz so it could even get a sequel. Finally a movie that shows motivated actors, a great storyline and attention for detail. It will not get an Oscar nomination, but it will bring you lots of fun and nostalgia even if you have never seen an 80’s horror movie. Sounds very impressive; I will be watching this one! They are. Thanks for always commenting. I appreciate your support.